Blinky Grid is a reprogrammable LED matrix. It has 56 LEDs and can display text and animations in a variety of ways. You can update the displayed messages without needing any special hardware or interface cables, simply by holding the blinky up to your monitor and using our programmer webpage. Blinky POV is a reprogrammable LED kit that uses persistence of vision to create the illusion of text or a small picture floating in the air. You can update the displayed messages without needing any special hardware or interface cables, simply by holding the blinky up to your monitor and using our programmer webpage. 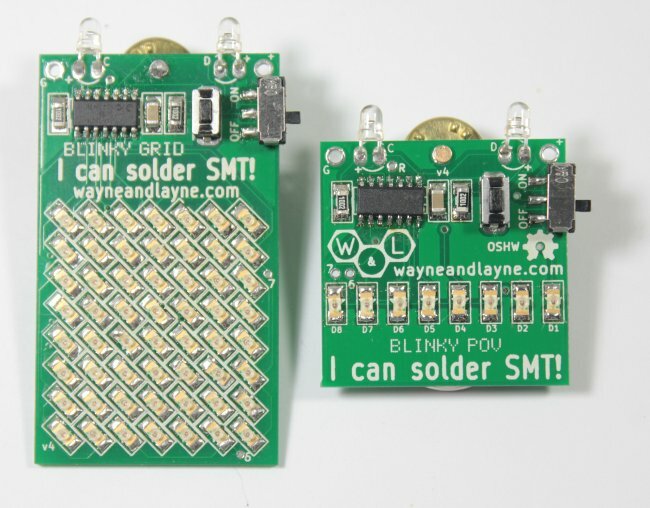 Learn and practice surface-mount soldering with Blinky Grid SMT and Blinky POV SMT! You can update the displayed messages without needing any special hardware or interface cables, simply by holding the blinky up to your monitor and using our programmer webpage. The Video Game Shield is an Arduino add-on shield to make your own video games, including graphics, text, sound effects, and music! Using the power of open source, this Shield includes everything you need to make awesome black-and-white video games on your TV. It supports up to two Nintendo Wii Nunchuck or Classic controllers for an easy and familiar interface. The Battery Booster Shield is an add-on for the Arduino that efficiently boosts a lower input voltage (0.65V to 4.5V) up to 5V. It powers the Arduino and peripherals through the 5V pin. The current limit is determined by the input voltage, and ranges from 70mA for 0.65V up to 550mA for 4.5V. The Bluetooth Arcade Controller is an easy way to convert your Arduino Mega into a Bluetooth keyboard, to connect to a computer, smartphone, or tablet computer. It was featured in an article in Make Magazine Volume 28!